The discussion begins with control valve flow characteristics (the relationship between valve opening and flow). Actually, a control valve has two characteristics—an inherent characteristic and an installed characteristic. The inherent characteristic of a valve is the characteristic published by the manufacturer, based on tests performed in a system where great care is taken to ensure that the pressure drop across the test valve is held constant at all valve openings and flow rates. The inherent characteristic, therefore, represents the relationship between valve flow capacity and valve opening when there are no system effects involved. Figure 1 shows the ideal inherent characteristics of the two most common flow characteristics, the linear and equal percentage. The source of the name of the linear characteristic is self-evident from the graph. 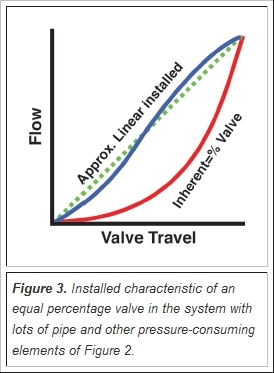 The name of the equal percentage characteristic comes from the definition: “Equal changes in valve position cause equal percentage changes in flow.” The result, as shown in Figure 1, is a characteristic where a small increment of valve position at small openings results in a small increase in flow capacity, while the same increment of valve position at large openings results in a larger increase in flow capacity. Most control systems give the best performance when they behave in a linear manner. In light of this fact, the question might be asked, “Why would you use an equal percentage valve which is not at all linear?” The answer is because of the installed characteristic. The installed characteristic is the relationship between valve position and flow in the specific system being considered, taking into account any changes in the pressure differential available to the control valve due to the flow squared relationship between flow and piping pressure losses and/or the behavior of a centrifugal pump’s head curve. The majority of fluid process systems include a significant amount of pipe and other pressure-consuming elements (elbows, pipe reducers, isolation valves, heat exchangers, pumps whose pressure decreases with increasing flow, etc.). This results in a relationship between system flow and pressure differential available to the control valve similar to the lower curve of Figure 2. 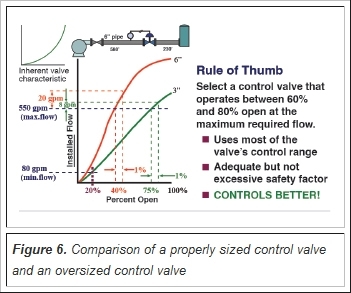 While referring to Figure 3, one must imagine a control valve with an inherent equal percentage characteristic installed in a system that has a characteristic like the lower curve of Figure 2. When the control valve is wide open, the flow will be at its maximum value. Moving the control valve in the closing direction of course causes the flow to decrease. 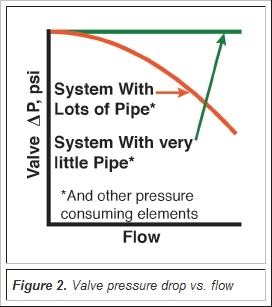 As soon as the flow starts to decrease, it can be seen from Figure 2 that the pressure differential across the valve increases, resisting the decrease in flow through the valve. The result of this interaction between control valve and system produces a nearly linear installed characteristic and thus the popularity of the equal percentage flow characteristic and the fact that equal percentage valves are specified about 90 percent of the time. Because the equal percentage curve and the pressure drop curve are not exact mirror images of each other, the installed characteristic of an equal percentage valve in a system with a lot of pipe is not perfectly linear, but has a slight “S” shape as shown in Figure 3. Sometimes it will not be as symmetrical as shown. As a general rule, systems with a significant amount of pipe and/or other pressure-consuming elements (the most common case) are best suited to equal percentage inherent characteristic valves. When a control valve is installed in a system with very little pipe and/or other pressure-consuming elements, the pressure differential across the valve remains constant, or nearly constant, with changes in flow as shown in the upper graph of Figure 2. The situation is similar to the way valve manufacturers determine the inherent characteristics of their valves. Since the pressure differential across the valve remains constant with changes in flow, the installed characteristic will be the same as the valve’s inherent characteristic. In the case of a system where the pressure drop across the control valve remains constant with changes in flow, a valve with a linear inherent characteristic will also have a linear installed flow characteristic. As a general rule, systems without a significant amount of pipe and/or other pressure-consuming elements are best suited to linear inherent characteristic valves. 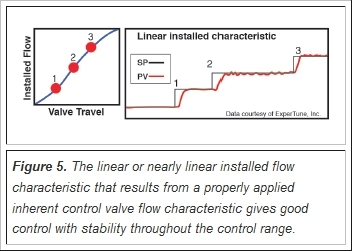 The symptom of a misapplied control valve flow characteristic is a control loop that only gives good control at one end of its operating range and is either sluggish or becomes unstable at the other end of its operating range. An example of a misapplied valve inherent flow characteristic would be an equal percentage valve in a system with very little piping. The left-hand graph of Figure 4 shows the resulting non-linear (equal percentage) installed flow characteristic, which is very undesirable. 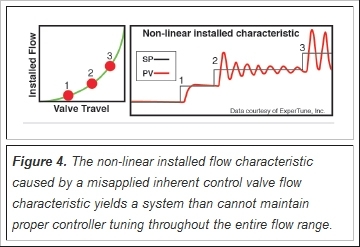 Upon start up of this system, if it was running at a low process load, the valve was around 25 percent open (Point 1) and after going through the process of tuning a PID controller, one can see that the slope of the valve’s installed characteristic curve is quite shallow, meaning that the valve’s gain (or the sensitivity of flow to changes in valve position) is quite low. To make up for this, the proportional gain of the controller would need to be set fairly high. As expected, when one makes a step change in the set point, there is a quick and stable response. Later, when the process load has increased, the valve might be around 50 percent open (Point 2). 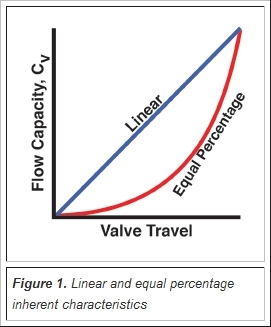 At this point, the slope of the valve’s installed characteristic curve (its gain) is higher meaning that the value of controller proportional gain previously selected is higher than it should be when the valve is 50 percent open. When the set point is stepped up from the current 50 percent position there is an oscillatory response. When the process load increases to where the valve is around 75 percent open (Point 3) the slope of the valve’s installed characteristic curve is quite steep, meaning that the valve’s flow gain is quite high. The value of controller gain originally selected when the valve was 25 percent open is now much too high, and when the set point again is stepped up there is a very unstable response. If the loop were instead tuned when the control valve was 75 percent open, a lower value of proportional gain would have been used, and there would be a fast, stable response to a step change in set point. However, if operated at lower loads, the response would be very sluggish. If one had misapplied a linear valve in a system with a lot of pipe, the situation would be the opposite of what is shown in Figure 4. Just as the system with a lot of pipe pushes the equal percentage inherent characteristic upward into a linear installed characteristic, it would push a linear inherent characteristic upward into a quick-opening characteristic. With a quick-opening characteristic, a small increment of valve position at small openings results in a large increase in flow capacity, while the same increment of valve position at large openings results in a small increase in flow capacity. This system would be very sensitive at low valve openings and very insensitive at large openings. The system would still be difficult or impossible to tune so as to get fast stable response throughout the flow range. On the other hand, a properly applied control valve inherent characteristic (an equal percentage valve in a system with a lot of pipe, or a linear valve in a system with little pipe) results in a linear, or at least nearly linear installed characteristic, as shown in the left-hand graph of Figure 5. A linear installed characteristic gives responsive and stable control throughout the entire flow range. This properly applied valve’s installed flow characteristic has a slope (and sensitivity of flow to changes in valve position, that is, its flow gain) that is quite constant throughout the entire flow range. Regardless of what the operating point was during the controller tuning process, the PID tuning parameters selected would be appropriate at all points in the operating range. Next, it’s important to understand the importance of proper control valve sizing. If the right size valve is not selected, there are two possibilities: (1) The valve may too small. If it is, it won’t be able to pass the required flow. In actual practice, undersized valves are fairly uncommon; (2) The valve may be too large, which turns out to be all too common. An oversized control valve will cost more than is necessary, although that is only a minor point compared to the real problem. The real problem with an oversized valve is that it will be very sensitive, meaning small changes in valve position will cause large changes in flow. This will make it difficult, or even impossible, for it to adjust exactly to the required flow. Starting at 550 GPM, if the properly sized valve opens by 1 percentage point the flow will increase by 8 GPM. If the oversized valve opens by 1 percentage point the flow will increase by 20 GPM. All valves exhibit a certain amount of stickiness. After a valve has been in service for a long time, especially if someone has been a little overzealous in adjusting the packing, it is not unusual to find that the smallest increment that the valve can move is 1 percent. If the best each of these valves can do is position themselves in 1 percent increments, the 3” valve will be able to control flow within 8 GPM increments, and the 6” valve will only be able to control flow within 20 GPM increments. In general, the more oversized a control valve is, the poorer the accuracy of control will be. Although not always possible, it is also preferable to have the minimum opening no less than 20 percent to provide some safety factor at the low end. Normally, control valve manufacturers publish Cv values in 10 percent increments beginning at 10 percent open, so it’s impossible to know what happens to the Cv below that point. It is also not uncommon for the inherent characteristic to start deviating from the ideal somewhere below 20 percent open. It is not unusual to find properly sized full-ball, segment-ball and high-performance butterfly valves that are two sizes smaller than the line and properly sized globe valves that are one size smaller than the line. This is not a rule, but just the way things often turn out. If a valve is sized, and it turns out to be different than these, it is a good idea to check the work. A mistake may have been made. Additionally, the person who sized the pipe may have made a mistake. Most people consider it poor piping practice to use a control valve that is less than one half the line size or larger than the line size.